You can monitor other companies that you compete with in your industry using the competitors report. Setting up this report will allow you to record your site's authority over time and help you determine action items and benchmarks to increase that authority. If you are a Marketing Hub Basic, Professional, or Enterprise user, you can track up to 20 competitors at once. Trial accounts can track 10 competitors. In your HubSpot account, navigate to Reports > Analytics Tools. Click Competitors, then click Add a new competitor in the top right corner. Think about which of your competitors' websites you would like to compare your company's site to. While you will want to add companies from your industry that you directly compete with, you can also add companies in your industry that you respect and model your business after. Enter the company's website URL, then click Add Competitor. This report gathers data from several different data sources, so it may take a few minutes to process your addition. Once the site is done processing, the competitors report will display all the available data. You will see either an i icon or a yellow ! icon next to each competitor. The yellow icon tells you that HubSpot was not able to determine all of the site information for your competitor. Click the ! icon to fill in this information manually. You can also click the i icon to update a site's info at any time. 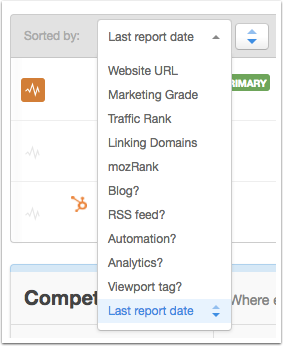 If you are concerned about the accuracy of the data in the report, click these icons to ensure HubSpot is tracking the correct blog and/or social media sites. Marketing Grade - a holistic measure of a site's online presence as measured by HubSpot's Marketing Grader on a scale of 0-100. This data is collected by HubSpot's Marketing Grader. To see the breakdown of your score or the score of one of your competitors, click the value in the Marketing Grade column of the competitors report. Traffic Rank - rank as compared to millions of other sites on the Internet. A lower rank is better. This data is collected and should match the data from Alexa. Linking Domains - the number of domains currently linking to a site as recorded by Moz. Unlike HubSpot's Links tool, the competitors report only gathers data from Moz; this kind of referral traffic data is not collected in the sources report as your HubSpot tracking code is not on your competitors' sites. MozRank - A measure of link authority and popularity, on a scale of 1-10. This data comes from Moz. Once you have finished adding competitors, you can sort and compare your competitors by any of the metrics listed above. To sort your competitors, click the Sorted by dropdown menu. You can have five metrics showing on your data table at any given time. To change which metrics are displaying, click any of the Showing dropdown menus. Click the colored graph symbol next to your competitors name to show (or hide) the data for that competitor within the chart. To specify the timeframe and data type of the chart, click the dropdown menus and select a metric and timeframe. Click the domain of any of your competitors within the report to see a head-to-head comparison of your site and your competitor's. 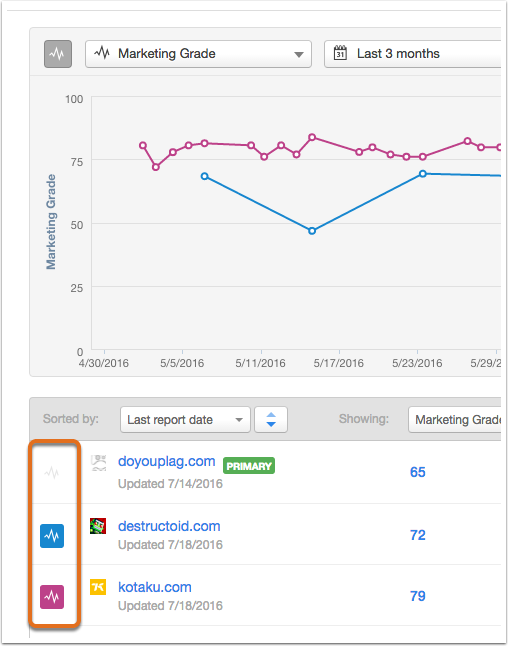 You can also access the full Marketing Grader report for your competitor from this detailed comparison by clicking Marketing Grader Report in the top right corner. To improve your marketing grade, try increasing the frequency at which you publish new blog posts. To improve your traffic rank, MozRank, and linking domains, create enticing offers that help drive traffic to your site from various channels. If you are checking this report monthly, you may want to develop action items and goals each month to increase your site's performance in comparison to your competitors. How do I change my site in the competitors report? In the competitors report, your company's main domain is set by your target domain. Your target domain affects many of the HubSpot tools, such as page performance, keywords, links, and competitors. If you want these tools to track across all of your subdomains, you will want to set your target domain to be your domain name (e.g. hubspot.com). If you want to limit these tools to a single subdomain instead, you will want to enter that specific subdomain (e.g. shop.hubspot.com). 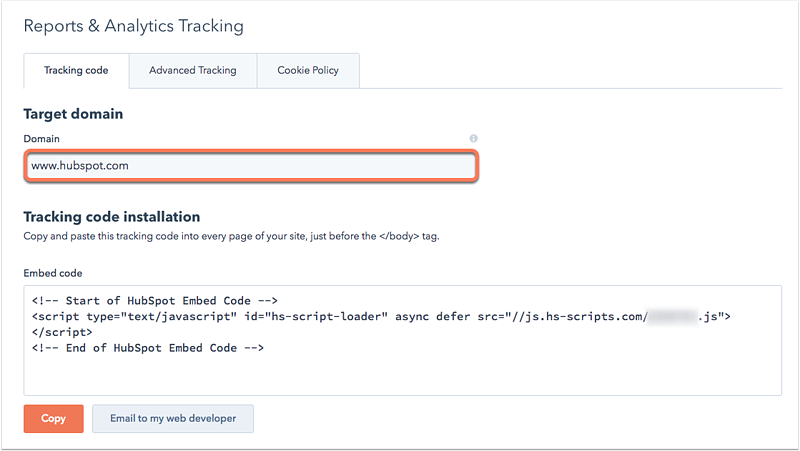 If you no longer want to track a competitor, click the gear icon to the right of the website you'd like to remove and select Remove website.